The appeal of real estate investing comes in large part from the classic economic standard principle of supply and demand. As long as the planet Earth remains our only source of land, the supply of real estate remains constant. As long as the population of the planet increases, the demand for real estate will increase. Supply, limited. Demand, rising. Value, increasing. Thus, real estate would seem to be a steady source of investment success. 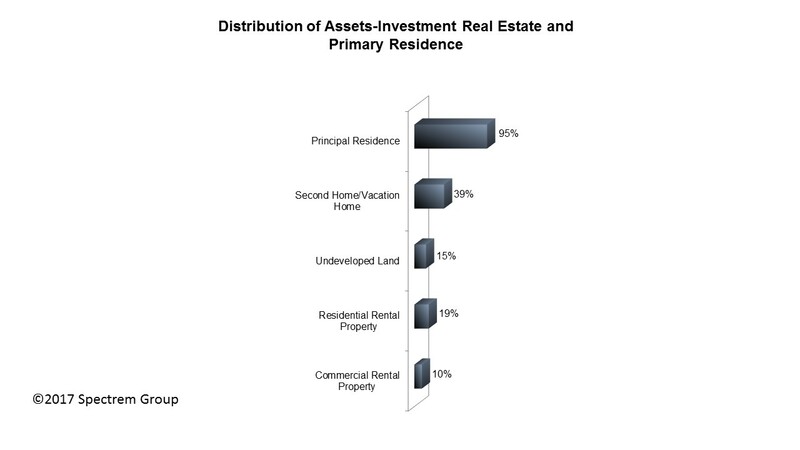 According to Spectrem’s annual wealth segmentation study on the portfolios of affluent investors – Asset Allocation, Portfolios and Primary Providers - between 6-7 percent of an investor’s assets are in real estate, not including the investor’s principal residence. That percentage has been the same since 2010 when the recovery from the 2008 recession was beginning to occur. The investors studied in the Spectrem report included Millionaires with a net worth between $1 million and $5 million and Ultra High Net Worth investors with a net worth between $5 million and $25 million. Real estate is not by nature a short-term investment, unless the investor is a property flipper by trade, with a plan to improve the property quickly and resell it. Instead, real estate increases in value slowly but is not a market that usually suffers from current events or political maneuvers. While housing is a fluctuating market, real estate is not. With all of that in mind, advisors must understand the real estate market as an investment vehicle and comprehend the many ways an investor can invest in real estate, from simple land purchases to real estate investment trusts and even time shares and vacation club ownership. According to the Spectrem’s study, among UHNW investors, almost 40 percent own a second or vacation home. There are obvious personal pleasure reasons for owning a second home, but it is also a way to put a significant sum of money into a property that often has a very high resell value. Among the less wealthy Millionaire investors, 22 percent own second homes. The ownership of undeveloped land ranges from about 12 percent among Millionaires to 19 percent among UHNW investors. Often, this is land the investors have plans to develop or have plans to upgrade to make the property more desirable among large construction companies looking for new property upon which to construct new housing. Advisors are not required to be real estate agents or assessors, but having a real estate contact can make these investments easier to find and can assist in determining the best land to purchase or invest in. Another frequent form of real estate investing is in owning residential rental property. Among Millionaires, 12 percent own rental property and among UHNW investors it is 19 percent. This is another form of investment that requires research, because the investor is in effect becoming a landlord if they are the lead investor, and landlords must hire managers and handymen to maintain the property and the rental status of units. Real Estate Investment Trusts, on the other hand, are investment in real estate but the investor is not so aligned with one piece of property. Advisors are asked to understand many different forms of investment, and real estate is a complicated one. Having a reliable real estate expert for investment purposes would be a positive addition to your team of experts. Unlike many other forms of investment products, real estate is one investors may have a preconceived notion about in terms of its value. Make sure your investor is operating from a proper point of knowledge on the subject, but explore it as far as the investor is interested.